Urs Fischer, Untitled (Lamp/Bear), 2005-6. Cast bronze, epoxy primer, urethane paint, acrylic polyurethane topcoat, acrylic glass, gas discharge lamp, stainless-steel framework, 275 5/8 x 255 7/8 x 295 1/4 in. © the Artist. Courtesy of the Artist and Galerie Eva Presenhuber, Zurich. Photo courtesy of Cary Whittier. 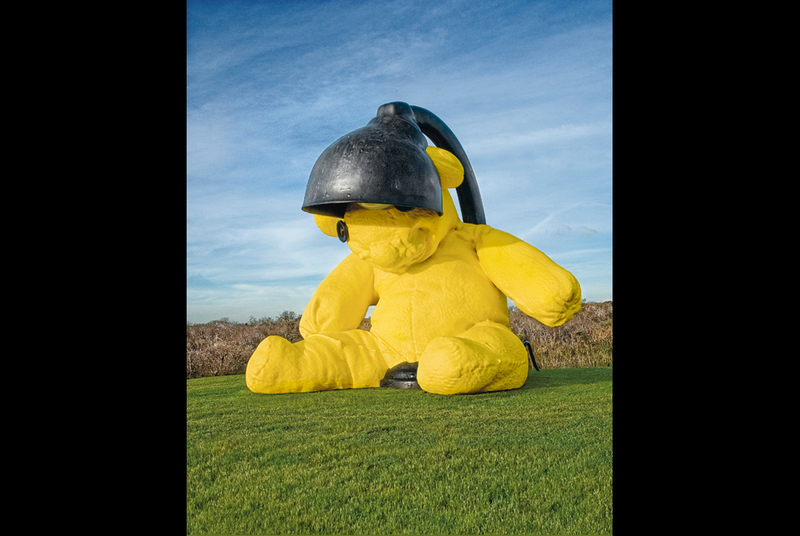 NEW YORK (REUTERS).- London has Paddington Bear but New York now has a giant yellow teddy bear, a great sculptural masterpiece that could sell for more than $9 million at auction in May, Christie's said on Saturday. A 23-foot (7-meter) high, bronze teddy bear slumped under a black bedside lamp will be on display for five months in midtown Manhattan from next week and be a highlight of the Post-War & Contemporary sale on May 11. The 35,000 pound (15.8 metric tons) sculpture, Untitled (Lamp/Bear), is the work of New York-based Swiss artist Urs Fischer. Brett Gorvy, Christie's deputy chairman for Post-War and Contemporary Art, described Fischer as the Jeff Koons of his generation. "We have seen contemporary sculpture works by Jeff Koons selling at $25 million and Urs Fischer is the leading pretender to the throne," he said. "He is considered the most important, the most provocative of contemporary artists today." Gorvy said the U.S. collector selling the sculpture, whom he declined to name, had already turned down a private offer of $9 million. "The anticipation is that it will make more than that," he said. "There's a very good chance it's going to go to a museum or a private institution." The teddy bear, which has button eyes, is currently being assembled in the plaza of the architecturally acclaimed Seagram Building skyscraper on Park Avenue. Gorvy said getting the city permits to install the sculpture was a project in itself. An added feature of the sculpture, according to the auction house, is that the table lamp above the bear's head works, so the bear can be lit up at night. "A true landmark sculpture of this nature appeals to private collectors and museums around the world, but could be acquired by a city as a means of attracting cultural tourism," said Gorvy. Christie's said the sculpture had been inspired by Fischer's own much-loved teddy bear. Fischer sewed together a one-foot tall teddy bear and scanned it with a 3-D laser to generate drawings to create the sculpture. It is one of three created in 2005/06. The other two teddy bears are privately owned. U.S. collector Adam Lindemann has installed his sculpture on a bluff at his property on Long Island in New York.